Philip Guston: Head and Bottle (1975). 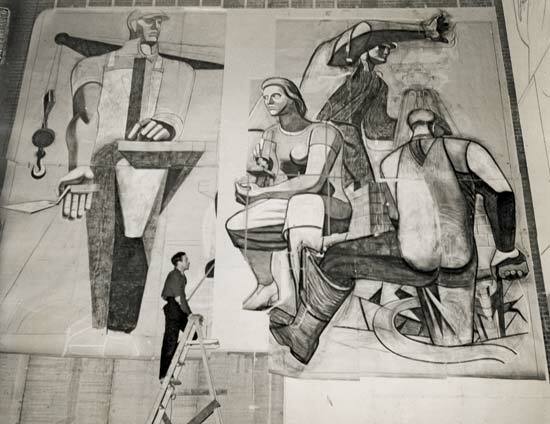 Philip Guston working on a mural, c.1940. 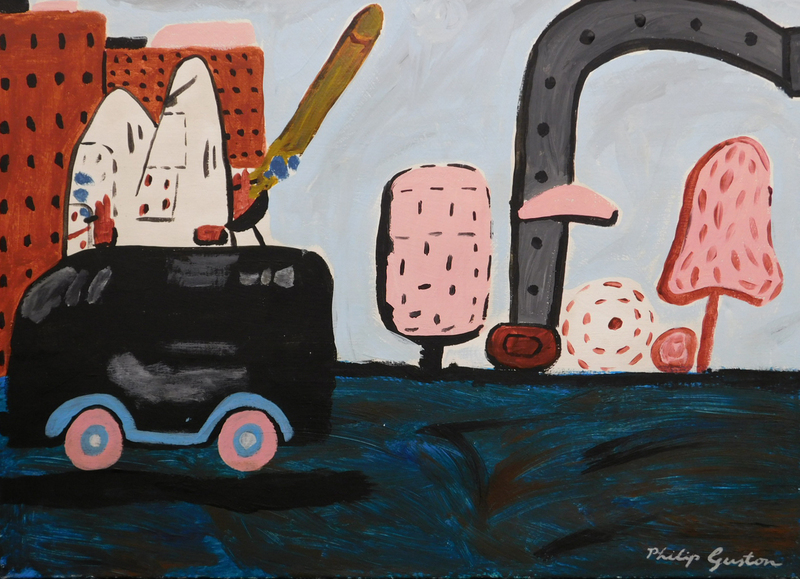 Philip Guston was born in Montreal, Canada and moved with his family to America (Los Angeles) when he was 6. He went to the Manual Arts High School with Jackson Pollock (they both were expelled) and received a scholarship to Otis Art Institute, which he attended briefly. 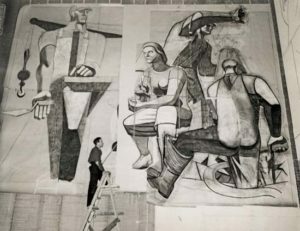 In the 30’s he painted murals for the WPA on their Federal Art Project and later taught painting at the State University of Iowa. In the mid 40’s he moved to New York and became part of a circle of artists, writers and composers, including Willem de Kooning, Mark Rothko and Jackson Pollock. 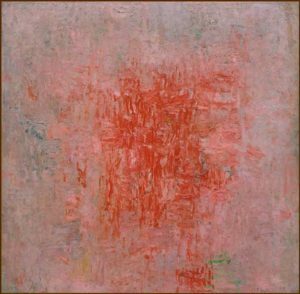 Guston was part of the Postwar Abstract Expressionist movement in New York, also known as the New York School. During this phase he experimented with color through non-representational paintings. 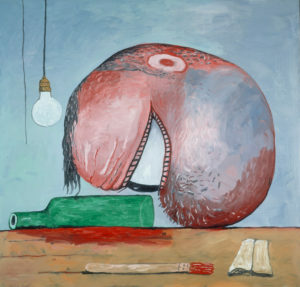 Guston received awards and prizes for his work, including a Guggenheim fellowship and a Prix de Rome, which enabled him to live and work in Europe for a year. The Museum of Modern Art purchased one of his paintings and he had a major retrospective at the Guggenheim Museum in 1962. Then, in mid stride of his rising fame, he moved to Woodstock, New York and began painting in a symbolic style that completely rocked the art world. Crude figures and objects rendered in bold brushwork were presented to the New York art world and met with scathing reviews. The New York Times art critic Hilton Kramer wrote an article titled: A Mandarin Pretending to Be a Stumblebum, in which he ridiculed this new style. 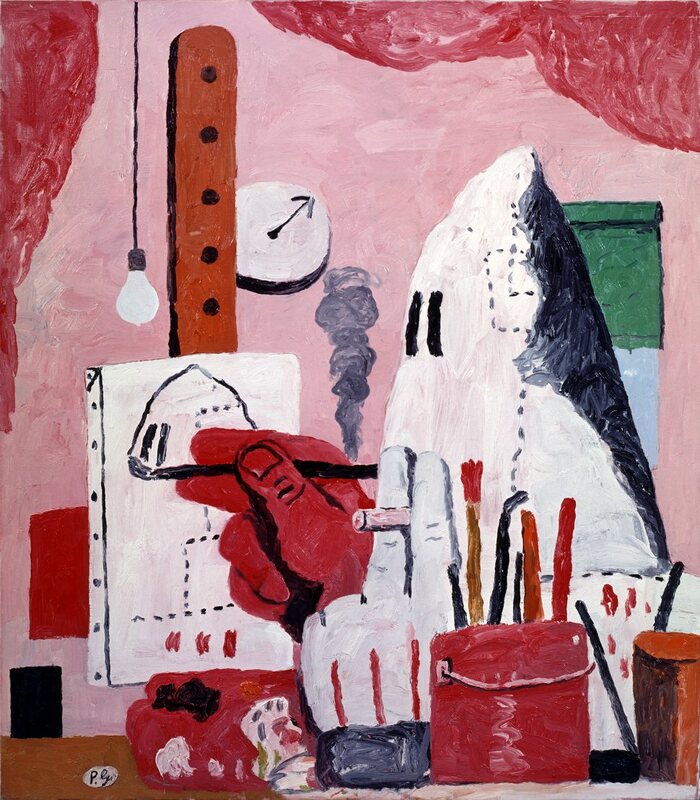 Philip Guston: The Studio, oil on canvas,1969. 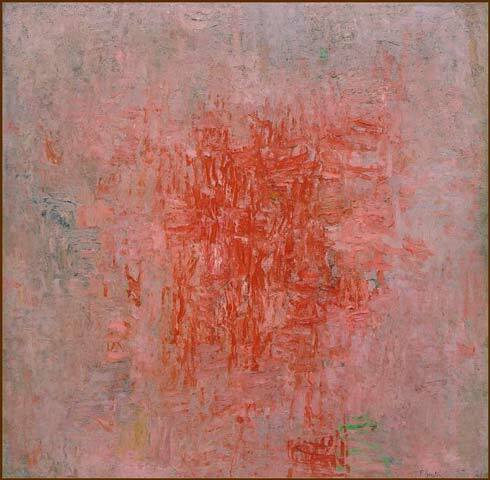 But for Guston they made sense as he sought to address inner turmoil and who he was as an artist. During the 60’s, the Viet Nam War, political and social upheaval, and the brutality of the world were all important issues for him. The images that began to appear in his paintings were grotesque and humorous – some were flashbacks from his childhood, both real and imagined. Guston created a lively cast of characters—sinister, hooded figures reminiscent of the Ku Klux Klan; heads with a large, protruding eye; disembodied limbs. Seemingly mundane objects, such as bare light bulbs, shoes, cigarettes, and bricks were also imbued with personal meaning. This style of painting is known as Neo Expressionism and Philip Guston is credited for its inception. Hooded Figures Driving, oil on canvas. Hooded figures drive through a landscape that borders on the industrial and otherworldly. Fleshy pink shapes are cartoonish versions of pines, hedges and topiary trees, while a heavy pipe-like structure interrupts the setting. A brown rocket-like shape represents power and danger, something that protects and also destroys. Guston explored these shapes, landscapes and figures as reflections of himself and the world he was living in.